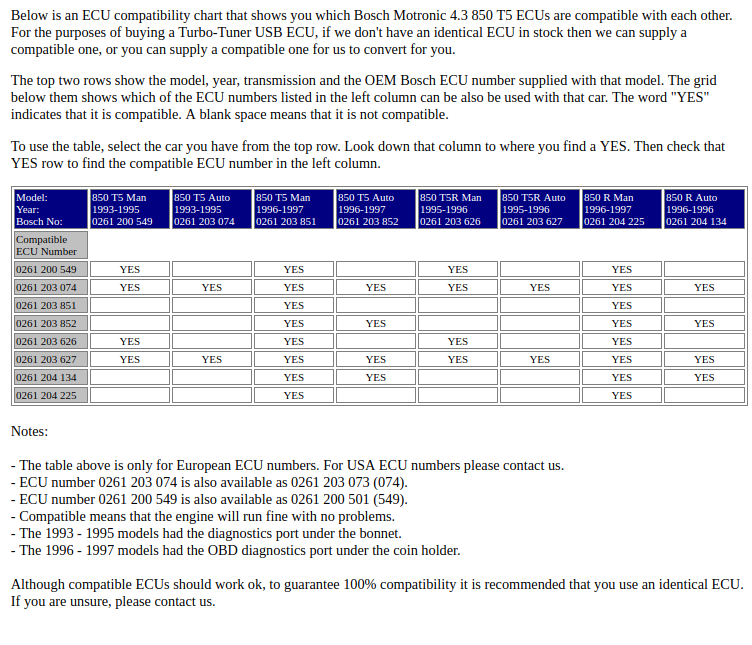 Anyone got a picture of that chart which lists the ECUs for an 850 that are compatible with each other? Cant seem to find it on the web anywhere. WOW! That sort of info should really be a 'Sticky' as it's priceless. I’ve got the pic to hand if anyone wants it. As a guide that is a great find, but some ecu's will work in vehicles that you would not expect them to, as I have found along the way, as I have run all sorts of ecu's in olive and most of the time they work when they don't work in other T-5R's ( i.e. my gul and Claymore's T-5R). Best was when Frankie wanted to try my Hlm304 in his 850R and I said fine, so I'll try your ecu in mine and we'll race them together for the next 1/4 run, he said we could but the 850r ecu won't work in a T-5R, so I said why do we try it, if it doesn't start, it doesn't start. So we popped in the 850r ecu and to Frankie's surprise, turned the key and she fired up straight away, to comments of that shouldn't work. It ran fine in the race, which I unfortunately lost at the post, due to the hitting the rev limiter earlier than I expected in 3rd, as his map was set lower than mine, not something I had thought about at the start of the race. Just to be a bit fussy......as always? Here is the actual whole pic from the webpage and to compere with the other one some words are missing from the bottom which i have surrounded with red dots. These missing words are very important as to what models you are playing with?? a good find though all the same.